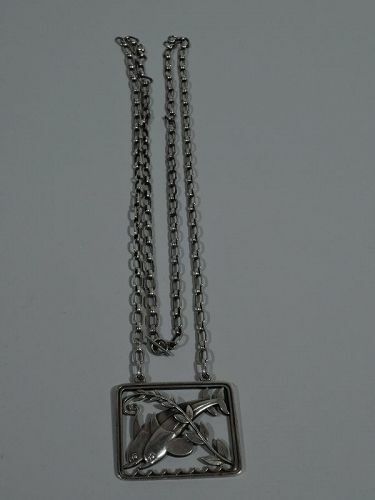 Beautifully executed sterling silver pendant necklace. Made by Georg Jensen in Copenhagen. Pendant: Open rectangle inset with two dolphins diving into scalloped waves. Chain: Alternating big and small oval links. Designed by Arno Malinowski. Pendant hallmarked (1933-44) and numbered 94. Very good condition. 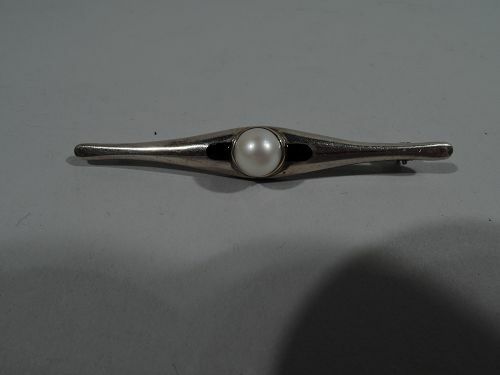 Art Deco sterling silver bar pin with tapering ends and culture pearl in 18k gold mount centered on central black enamel tube. Signed “18k 925 / Cartier”. Very good condition. 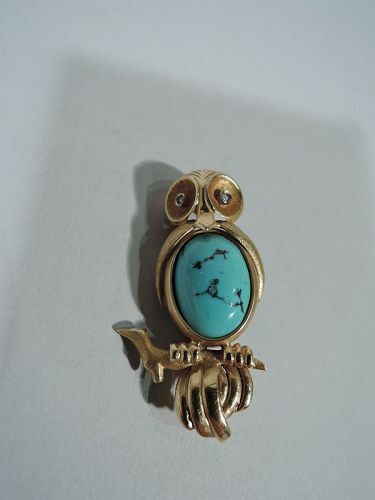 Delightful 18k gold figural pin. Stylized owl with ribbed crown, rose-diamond eyes set in concave disc sockets, sweet wing flaps, and branch-gripped talons. Breast inset with turquoise stone. A symbol of wisdom in the advanced taste. United states, ca 1930. Stamped “750”. Very good condition with great color. Pair of 18k gold and turquoise clip-on earrings. 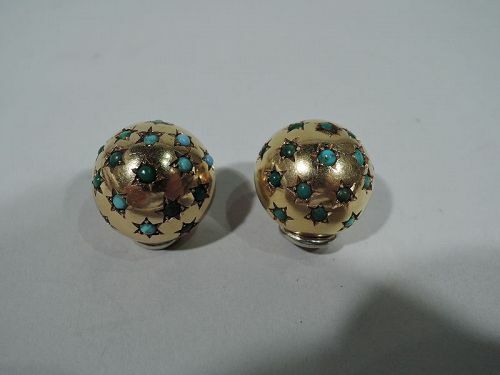 Each: Ball with incised stars inset with cabochon-cut turquoise beads. Smart and festive. United States, ca 1930. Stamped “750”. Very good condition with rich patina. 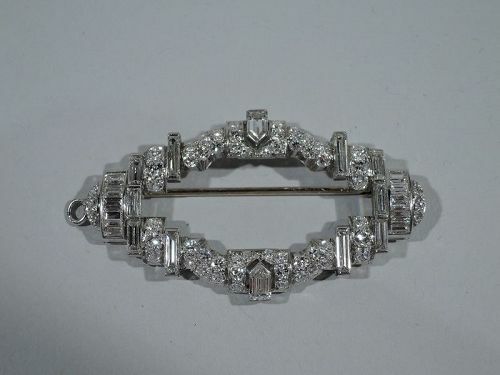 American Art Deco platinum and diamond brooch, ca. 1930. Rectilinear with brilliant- and emerald-cut stones. Excellent condition. 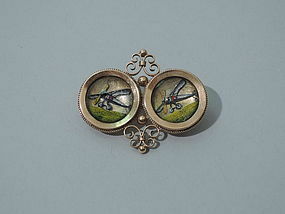 Two Essex crystals featuring enamel airplanes joined together by a decorative bead and scrolls 15K rose gold mount. English. Circa 1920. Very Good Condition. 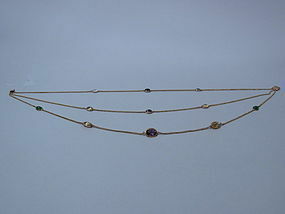 A striking 14K Gold Three Tiered Chain Necklace featuring Oval shaped Semi Precious Stones of varying sizes. These stones include Chrysophase, Citrine, Moonstone & Amethyst. The graduating gold chains measure 18 inches, 19 inches, and 20 ½ inches respectively and all connect to a rectangular bar clasp at the nape of the neck. American. Circa 1930’s. Excellent Condition.